a)	To use heavy weight load systems of the MKC-350, MKC-5-128P(M) series, the equipment and loads are mounted on а П-7 platform. –	Size of a platform: 3600×2600 mm It is possible to airdrop various equipment, drums, food items and other goods of the above-mentioned weight. An IL-76 aircraft carries 3 to 4 platforms depending on the weight and size of the load, and an AN-12 aircraft can carry 1 or 2 platforms. In 1990, using these systems the Company experts have successfully airdropped a bulldozer and a snowplowing machine modified from the DT-75 tractor weighing 8500 kg for the construction of an ice runway for a Sevmorgeologia expedition team. The runway was operational from April till June 1990 and could accommodate AN-12, AN- 26 and AN-74 type aircraft. 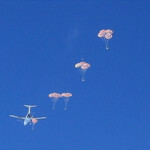 b)	The Company experts have developed methods to use personal parachute systems of Д-5, Д-6, C-5K, ПСУ-36, C3-3 type and others modified for parachute load airdropping, thus cutting down their cost. Such system is capable of airdropping a large variety of loads in this weight category, including even food in glass containers. The size of the landing area can be minimized to 400×600 m.
IL-76 aircraft carries 26 pallets. Maximum payload is 33800 kg. AN-12 aircraft carries 9 pallets. Its payload may reach 11700 kg. AN-74 aircraft carries 8 pallets. Its full payload may be 9500 kg (maximum payload). AN-26 aircraft carries 5 to 7 pallets, with full payload reaching 5500 kg (maximum payload). 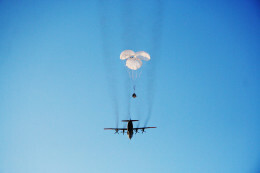 In 1993 the Company experts airdropped munitions and food in Angola, pioneering airdropping from an altitude of 7000 meters.